The Academy of Motion Picture Arts and Sciences has extended invites to 928 people, topping last year's then record of 774 new members. LOS ANGELES — The Academy of Motion Picture Arts and Sciences has invited a record number of new members, extending invites to 928 people. The Academy topped last year's then record of 774 new members. In an ongoing effort to diversify its ranks following uproar over the lack of African-American nominees over the last few years, which culminated in the #OscarsSoWhite controversy, 38 percent of the Oscars' governing body's new class is made up of people of color, increasing their representation from 13 percent in 2017 to 16 percent, according to the Academy. Meanwhile, the new class is 49 percent female, boosting the total representation of women from 28 percent in 2017 to 31 percent. Cheryl Boone Isaacs, president of the Academy in 2016, vowed to diversify the organization after it was criticized for not nominating a person of color in an acting category for the second year in a row. She declared that the organization would take "dramatic steps to alter the makeup of our membership." "This is a difficult but important conversation, and it's time for big changes,” Boone Isaacs said at the time. Some of the actors invited this year include Daniel Kaluuya, Mindy Kaling, Tiffany Haddish, Kumail Nanjiani, Dave Chappelle, Randall Park, Daisy Ridley, Timothée Chalamet, Gina Rodriguez, and Jada Pinkett Smith. Angela Robinson ("Professor Marston and the Wonder Women"), Justin Simien ("Dear White People"), and Sean Baker ("The Florida Project") are among the directors invited to join the Academy. International filmmakers include Luca Guadagnino, Andy Muschietti, Chloe Zhao, Nadine Labaki, Jean-Pierre Jeunet, Ziad Doueiri, and Michel Gondry. Writers tapped include J.K. Rowling, Emily V. Gordon, Jonathan Nolan, and Joe Robert Cole. Invited musicians include Kendrick Lamar, Melissa Etheridge, Sufjan Stevens, and Questlove. 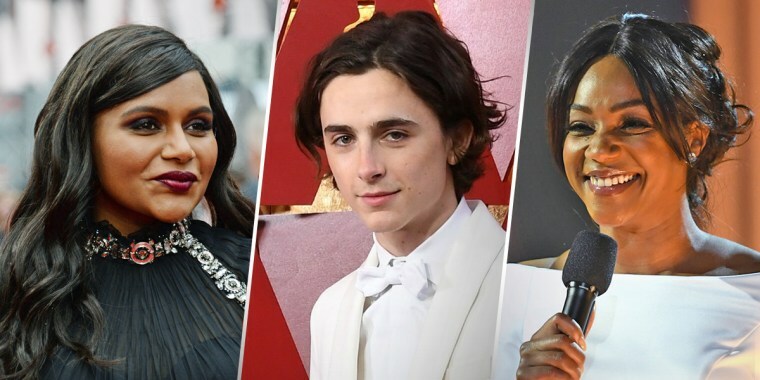 Among the new members — ranging from actress Quvenzhane Wallis (the youngest new member at age 14) to composer Sofia Gubaidulina (the oldest new member at age 86) — 17 are Oscar winners and 92 are nominees, according to the Academy. But despite increased focus on diversity in Hollywood in recent years, a 2017 report from the Media, Diversity, & Social Change Initiative at the University of Southern California's Annenberg School of Communication and Journalism found that the representation of women, minorities, LGBT people, and disabled characters in film remained poor in 2016. Of the speaking characters surveyed in the report, 70.8 percent were white; 13.6 percent black; 5.7 percent Asian; 3.1 percent Hispanic; and less than 1 percent American Indian, Alaska Native or Native Hawaiian. According to 2016 estimates by the U.S. Census Bureau, the nation is 62 percent non-Hispanic white, 17.3 percent Hispanic, 5.2 percent non-Hispanic Asian, 12.3 percent non-Hispanic black, 0.7 percent non-Hispanic American Indian and Alaska Native, and 0.2 percent non-Hispanic Native Hawaiian.